Some 5,021 are still active in their vocation, 560 have died and 440 have left the priesthood to return to their previous life. 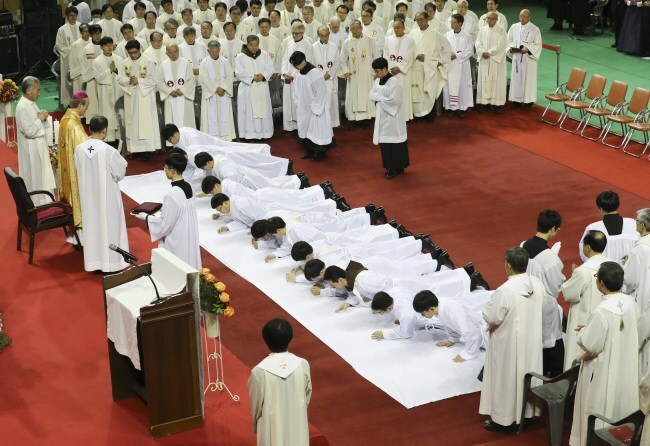 Seoul (AsiaNews) – More than 6,000 native Koreans have joined the Roman Catholic priesthood so far, according to local Catholic officials Tuesday. In its recently released 2017 directory, the Catholic Bishops' Conference of Korea notes that the number of ordained priests stood at 6,021 as of 30 September 2016. The list includes Father Andrea Kim, the first native Korean Catholic priest and martyr, better known by his birth name Kim Dae-geon. Overall, 5,021 priests are still active whilst 560 have passed away, and 440 have returned to their former secular lives.